A major research effort based on the use of camera traps started at the North Carolina Zoo in 2011. This particular project focused on learning more about predator species found on the Zoo's undeveloped land. John Groves, then the Zoo's Curator of Amphibians and Reptiles, wrote an article for FieldTripEarth that explained the purpose and method of the research project. 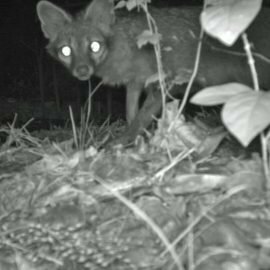 That article, Camera Trapping Research, should be read as an introduction to the Zoo's current camera trapping project, which started in Summer 2015. The North Carolina Zoo continues to monitor predators on the 1,000 acres of undeveloped forest land surrounding the developed area of the Zoo. This research project has given us a better understanding of both the species and the abundance of mammals living in the Zoo’s forested lands. 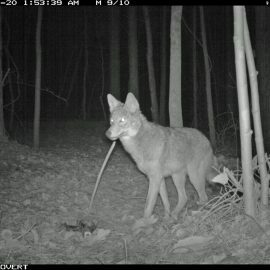 Camera traps in several locations have captured images of deer, turkeys, raccoons and opossums, as well as of local predators like coyotes and even a bobcat.